The Giro Knit Shoe Cover protects shoes from road grime in wet weather while also helping to keep feet warm. 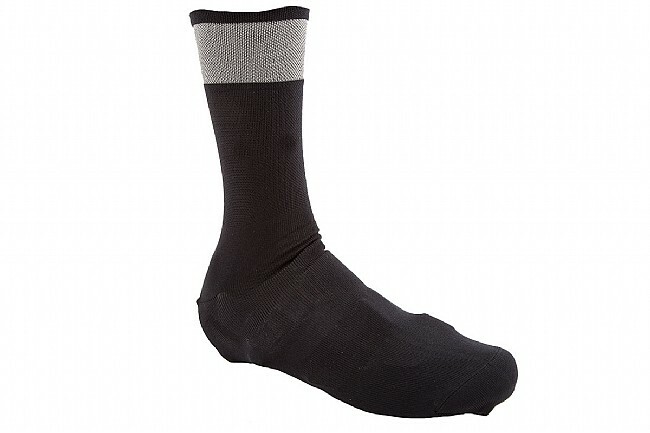 It's knit from a Cordura® reinforced thread for excellent durability, and the ankle cuff features reflective fibers for visibility in low light. Available in Black and Highlight Yellow. Great quality, stay tight after multie rides. These look great, fit snug , and hold up after multiple wears. These have been a nice addition for cool or damp rides, and the reflective band is a nice touch. One simple improvement would be for Giro to add a hole at the rear for a road shoe heel pad to poke through. If you get caught having to walk in these at all then you are treading directly on the knit material, which is guaranteed to wear through very quickly. Otherwise, nice product.